Whether you’re a novice or seasoned advertiser, you can benefit from Instagram’s business tools. Instagram has done it again. Earlier this year, it launched an algorithm that (somewhat controversially) placed the most individually relevant content at the beginning of each user’s feed. Now, Instagram has introduced a suite of business services to further solidify its standing as a legitimate and in-demand advertising business platform. Regardless of whether you’re a micro-business or a corporate Goliath, the need and opportunity within Instagram is significant. According to Instagram, about one-half of users now follow a business on the platform and even more—around 60 percent—say they’ve learned about products on Instagram. Instagram is a growing community, and users now rely on it as a source of new products, businesses and inspiration for their various needs. As the trends have shown, social posts that include pictures or videos are exponentially more popular compared to text or link-based posts, so it comes as no surprise that businesses would want access to this platform. 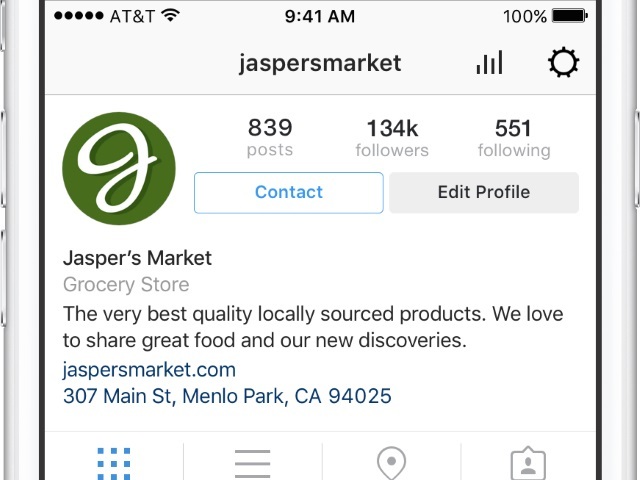 Instagram created profiles specifically for businesses. Companies that have Facebook pages can easily set up business profiles on Instagram. Specific criteria are required to register for a business profile, and the Facebook for Business credentials match those criteria. What’s so wonderful about a business profile? Its format offers several bonus buttons, which allow users to easily contact and connect with the business, all from the profile page. There is a contact button that, when tapped, pulls up the options to call, send an email or get directions to the business. By selecting the Get Directions button, your business location shows up on a map, so the consumer can navigate to your business or find its proximity to them. Categories have also been added to the business profiles. Categorization is a quick way to inform users of your industry and help them make a decision about your business’ relevancy to their search. All three features showcase your business in a professional way that confirms that it is a valid business, provides an efficient way for users to process your information and, most important, to contact you at the click of a button. The account insights, or analytics, offered by Instagram are similar to Facebook insights. They report critical information about post engagement and follower demographics so that businesses can develop more applicable posts for their audiences. Business profiles include follower demographic analytics, which track the location, gender and age of followers. Location information provides users’ time zones so that brands can post during peak times based on where their audience lives. The gender and age information further breaks down your followers’ demographics in order to show who makes up your active audience. Again, these kinds of analytics allow businesses to make decisions about content types and messaging based on age brackets and gender categories. An engaging post for a 55-year-old man looks and sounds very different than a compelling post for a 25-year-old woman. These metrics can guide your overall content strategy and assist your business in reaching your social media goals. Another valuable metric is impressions per post. Businesses can see which posts were the most popular and engaging over a seven- and 30-day period, as well as click on individual posts to see the specific impression numbers. This data is an important factor when developing new content, as it signals to specific trends and preferences. From this information, businesses can distribute the most enticing posts, pictures and videos to their audiences.